In figure A in diagram above, we see a queue collection (a container with data). When we add data into our queue (in this case people), we perform an operation known as enqueue. So we enqueued Kofi, Tarik and Julia, where Kofi is in the front of the line (the head of the queue). Because of this he gets served by the bank teller first. When Kofi’s transaction with the cashier is done, he is removed from the queue so the next in queue can be helped. This remove operation is known as dequeue. He is dequeued from the collection (see figure B). Finally Tarik is now in the front of the line (the new head). This operation continues until the queue is empty. We can repeat the process by adding more data to the queue. Very simple to understand. 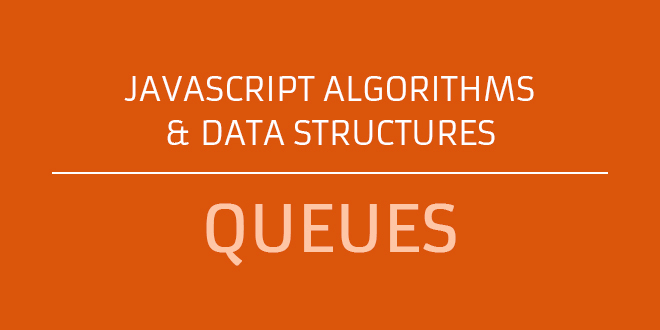 Now we can simulate other real world queue behavior. 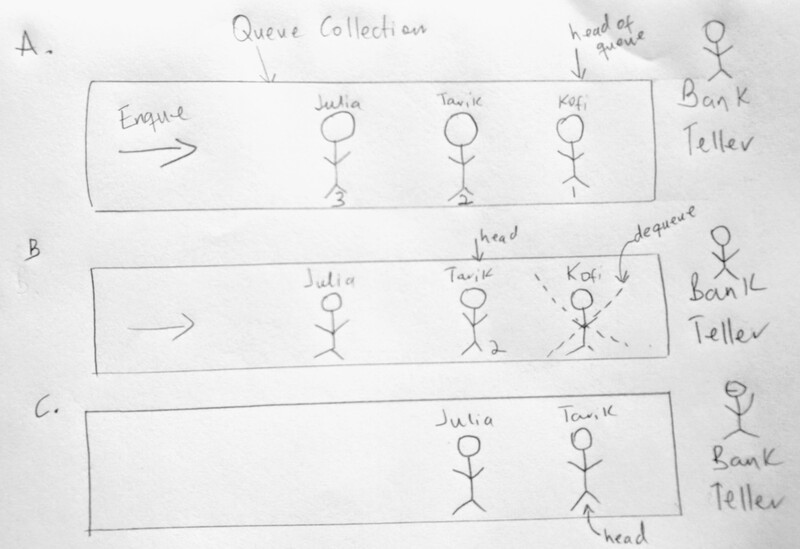 We can implement priority queues (queues that do not follow a FIFO order). In stead of removing the first in line, we remove items based on priority. Its like going to a an emergency room. Even if you got there an hour ago, someone (Patient Z) with a more severe injury that came in 5 minutes ago has priority over you (and goes first in line). And if another patient with that same severity comes in, then they would have to go in queue (behind Patient Z). We also have circular queues, where the first in line isn’t dequeued, however they are sent to the back of the line (Hot potato game anyone?). See the Pen Queue class shell by kofi (@scriptonian) on CodePen. See the Pen RgjMMb by kofi (@scriptonian) on CodePen. Now we will implement the queue helper classes. See the Pen Queue Operations Shell by kofi (@scriptonian) on CodePen. See the Pen Queue Operations Shell – ES2015 by kofi (@scriptonian) on CodePen. See the Pen Enqueue & Dequeue by kofi (@scriptonian) on CodePen. See the Pen Enqueue & Dequeue – ES2015 by kofi (@scriptonian) on CodePen. Try not to get bored with this super simple code. Enqueue just adds an item to the queue. All we are doing is pushing onto the array. Dequeue removes the first item in the array. We use the shift method in the array. Lets complete our other operations. See the Pen Queue Class – front(), back(), empty() and toString() by kofi (@scriptonian) on CodePen. See the Pen Queue Class – front(), back(), empty() and toString() –ES2015 by kofi (@scriptonian) on CodePen. I have already explain what all of these are doing, so no need to go there again. They are all self explanatory. Whew! Finally we can use our queue class. Lets create a queue at the bank. We will add the 3 users like we did in our diagram using enqueue and we will dequeue a user. We will console log to see what the looking looks like after performing some operations. Lets look at what is going on here. We create a queue and added 3 people to it. We can see in (1) that there are 3 items in the array. Then we dequeue the line (meaning we remove from the beginning of the array). 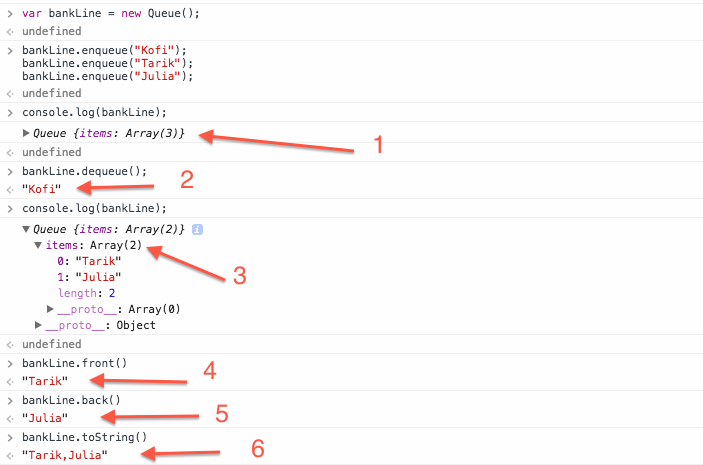 Since our dequeue method returns the element being dequeued, “kofi” is returned to us; leaving us with two users (3). When we check who is now in the front of the line (4) we get Tarik. And the back of the line is “Julia”. When we output everyone in the line, we have only two users, “Tarik” and “Julia”. Just like we would expect. Lets upgrade our queue. Lets get a more “real world”, where the first come first serve model (FIFO) is not always the case, even though there is a queue! We have all been there. For example when you are at the hospital, and someone with a more severe illness is brought in. They are seen first by the doctor. And what about airports! Isn’t there priority seating when its time to board the airplane? First class passages are seated first, followed by business class and finally we are last to board since we are flying coach (can you relate? i can!). The same thing happens at the night club. Everyone is in line and those are are willing to get a table get seated right away! Unless of course there are no more tables. But, even those that want a table have to get in line if there are others also waiting for a table. See the Pen Priority Queue Classes by kofi (@scriptonian) on CodePen. See the Pen Priority Queue Classes – ES2015 by kofi (@scriptonian) on CodePen. See the Pen Priority Queue – Enqueue & toString methods by kofi (@scriptonian) on CodePen. See the Pen Priority Queue – Enqueue & toString methods ES2015 by kofi (@scriptonian) on CodePen. Lets see what enqueue is doing. When we call enqueue, we pass it two parameters. These are then passed to our QueueItem object and then ultimately pushed onto the items array in the PriorityQueue class. When we create a QueueItem object we run a for loop that iterates over all the elements in the items array(if there are any). For each item in the items arrays we check to see if the priority of the new item we want to add is greater than the current object’s priority in the iteration cycle. If its greater, we use the arrays splice method to insert the new object in that location/index. If the current item if not greater than anything in the items array it simply gets pushed back. We use an itemAdded boolean flag to help us know whether the new queue item was added or not. If it wasn’t we use a simple push method to push it onto the array. Our print method also just iterates over the items array and logs each objects name and priority. Please note, i left out the other helper methods, like front, back, empty, etc. Nothing has changed for them, so i left it out so the code is shorter to read. However if you download the source on github, you will find the complete code with comments. You are very welcome Brefo. I hope to get the next one out soon!